Travis takes a look at the movie based on the board game Clue, and finds that it’s pretty good overall. Continue reading"‘Clue the Movie’ Reviewed"
I bet you thought Star Wars Day was May 4, right? That silly pun has gotten most of the attention, but given the significance of the day this year, we’re going to go ahead and celebrate the real Star Wars Day. Forty years ago today, May 25, 1977, was the world premiere of Star Wars (renamedStar Wars Episode 1: A New Hope when it was re-released in 1981), the movie that introduced the world to Jedi and Sith, droids and wookiees, Han Solo and the Force. It also sold a whole lot of theater tickets and toys. Continue reading"Happy Star Wars Day!" Guardians of the Galaxy Vol. 2 may be the most eagerly-awaited sequel outside the Star Wars brand, and James Gunn has delivered a winner. Some online critics feel that it doesn’t live up to the first, but I believe they are confused by the fact that the first one was an unexpected surprise they didn’t know they wanted, and this one is an eagerly anticipated treat that they are pumping up high expectations for. Since that joy of discovery is replaced by expectation, which can’t really compare, they are feeling a self-inflicted disappointment that is unwarranted. I loved it. Gunn still has some tricks up his sleeve. Continue reading"Guardians of the Galaxy: Eye Candy and Daddy Issues"
Sooner or later, like that fabled room full of chimps at the keyboard, a moviemaker would accidentally make a teen comedy that accurately reflected my high school experience. And it’s here. Home sick over spring break, I found me some cool Westerns. 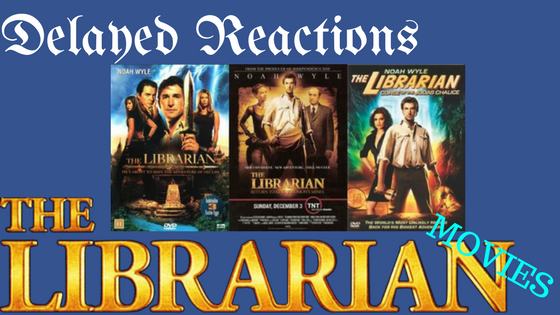 Continue reading"Sickbed Salvation Over Spring Break"
Continue reading"Delayed Reaction: The Librarian movies"